Blyde, John (, pen. pocket & table knives,scissors,razor manufts.). Address: Clintock Works 24 Milton Street, in 1905. Recorded in: White's Directory of Sheffield and Rotherham. John Blyde, Clintock Works, Sheffield. A foundation date of 1841 is recorded in the trade literature for this company. John Blyde(1827-1899), a Sheffield-born scissor and surgical instrument manufacturer, was working at Norfolk Street Works, Norfolk Lane, in 1862. 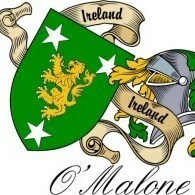 Ha may have been the son of James Blyde. By the 1870s, the address was Burgess Street, with John Blyde advertising surgical instruments, scissors, and trusses. The firm employed 27 workers in 1871. By 1883, the business had moved to Clintock Works, Milton Street. In directories in the 1880s, Blyde was described as a "Manufacturer of Fine Scissors, Pen, Pocket, and Table Knives; Razors, Horse Scrapes, Clipping Scissors, Singeing Lamps". John Blyde died "very suddenly" on 15 December 1899, aged 72. He was a Wesleyan Methodist. John Blyde's son, Arthur John Blyde(1857-19200, continued the business. According to local chronicler Henry Tatton, John Blyde's son, James, was remembered as the first man in Sheffield to drive a motor car. In 20th century, the business switched almost entirely to hand-forged surgical scissors. When A.J. Blyde died in 1920, his successors adopted limited liability and also took over Greenhough. The corporate mark was a picture of Saturn above the word "Genius", which was used on scissors and cutlery; and a picture of a golfer above the words, "Sure & Far", which was used on pen and pocket knives. A profile in Quality(March 1957) stated that it was the last surgical scissor house that could hand forge scissor of any description. In the 1970s, Blyde's was wound up. Could you post close up photo of the marks on the blade. Sorry for the delay on getting back to you.Have a new phone and have just sorted how to get close up photo,s. 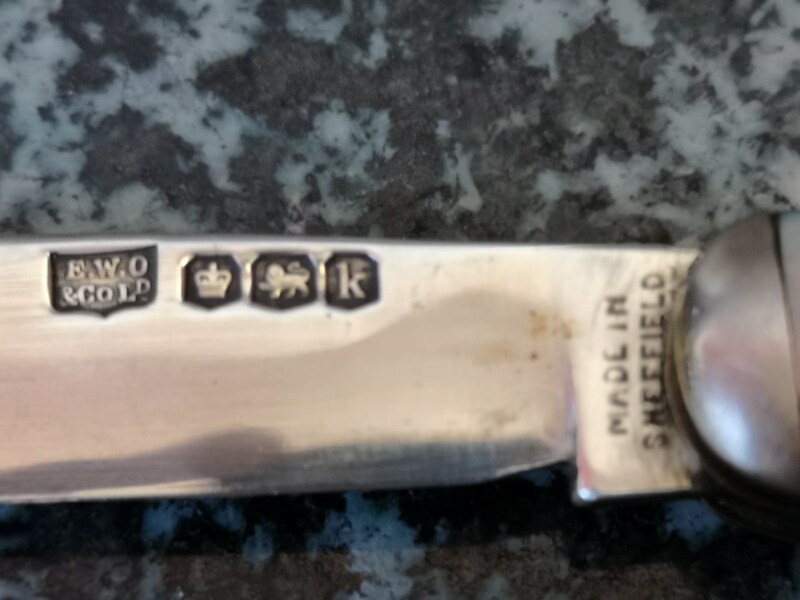 The silver blade plus everything else on this cracking knife apart from the steel blades was made by E W O & Co Ltd, still got to find out just who they were. 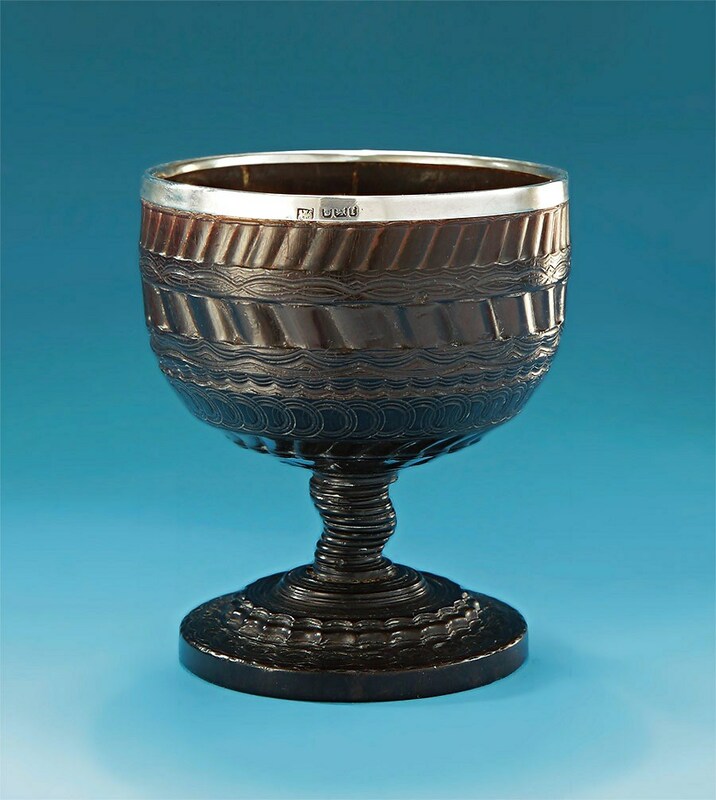 Here's a late 17th century cup made of Lignum Vitae but the silver rim was made by the same maker. Thanks so much tozzin .I've tried in vain to find out more and haven't had much luck.ime very great full for your knowledge and am looking forward to see if you are able to find out some more info.? Cheers. I think the hallmark letter K is for 1952. 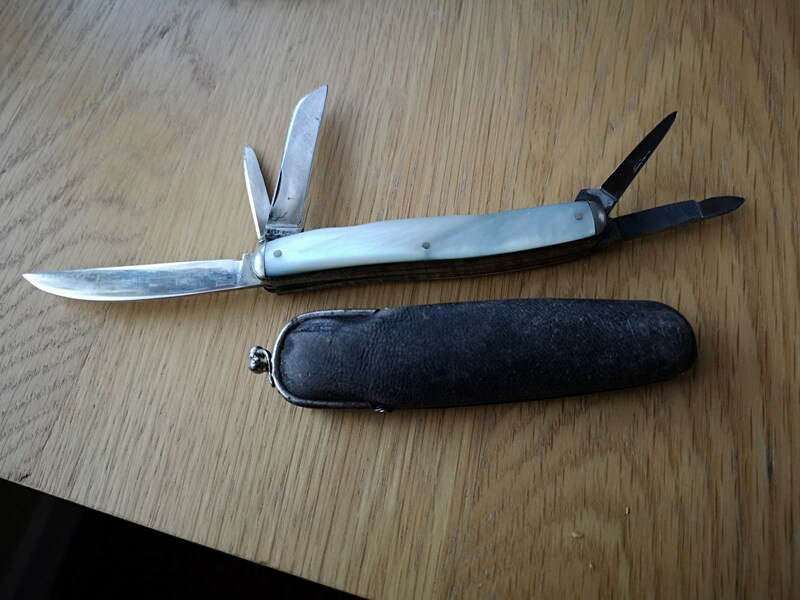 Oh ,the antique shop I bought it from marked it up as 1927.but they could be wrong.but the steel blades seem a lot older than 1952 tozzin.? I have had a closer look, yes your dealer was right, what threw me was the lozenge the letters in is more like the 1952 mark, but I should have looked closer. I worked at a firm that was using blades up to thirty years after they were forged. Thank you so much tozzin.? Just found this on the net tozzin which sort of confirms your research .thanks again ? So .John and tozzin do you think this knife is a combination fruit knife and the steel blades for other daily chores?. 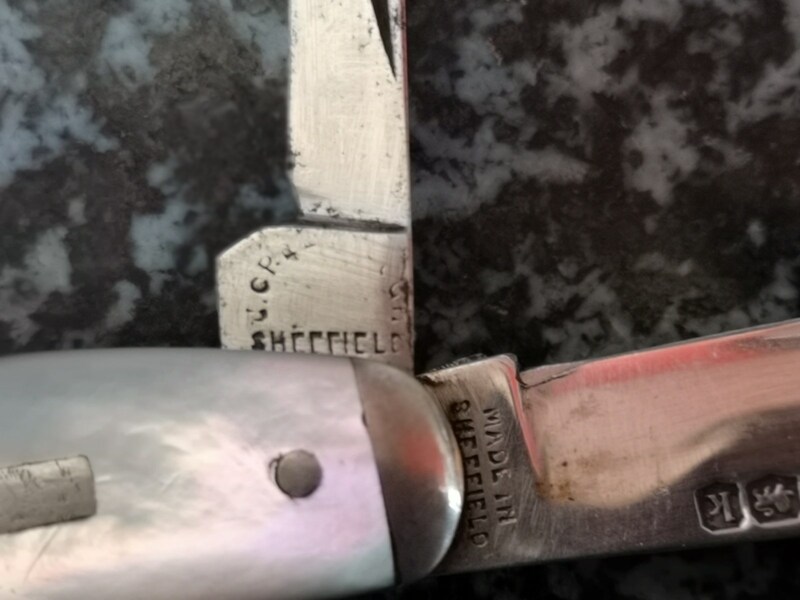 It certainly is, the acid in fruit would corrode steel blades but it doesn't corrode silver, as Michael Caine may have said " not a lot of people know that"
Cheers tozzin.i will have another Sheffield knife in a few days to show.all the best for now ? Hello. I was interested in the "Blydes" and came across this post, one of several posts relating these Sheffield makers. I have an electroplate mark on a spoon I want to add somewhere when I work out which "Blyde" it belongs to. I was looking at the Sheffield Indexers" and came to "Blyde Jno". I have seen the "Jno" with other names. What Christian name do we think it represents? Is it "Jonathon"? Or is it what they can see from the origional record? I was trying to get a date order of the Blydes. 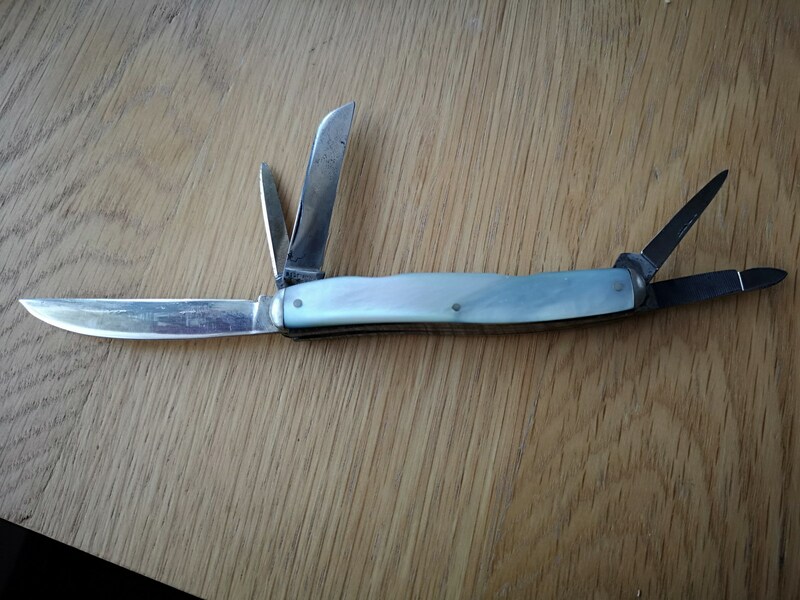 "Jno" was about 50 years earlier than "Adrian's" great penknife. We can positively date the knife blade to 1927, as that lower case "k" tells us that. It is not 1952 as which has an upper case "K". 1902 had a lower case "k" but it was in "fancy style" that my lap top does not know how to reproduce. That was a smart bit of work Adrian to find E.W.Oakes. Is it acceptable if I pass your hallmark image on further to be confirmed and likely recorded on line for the world to know (if they care to search)? Yes by all means ,looking forward to seeing what other information you find out.thankyou .Adrian. 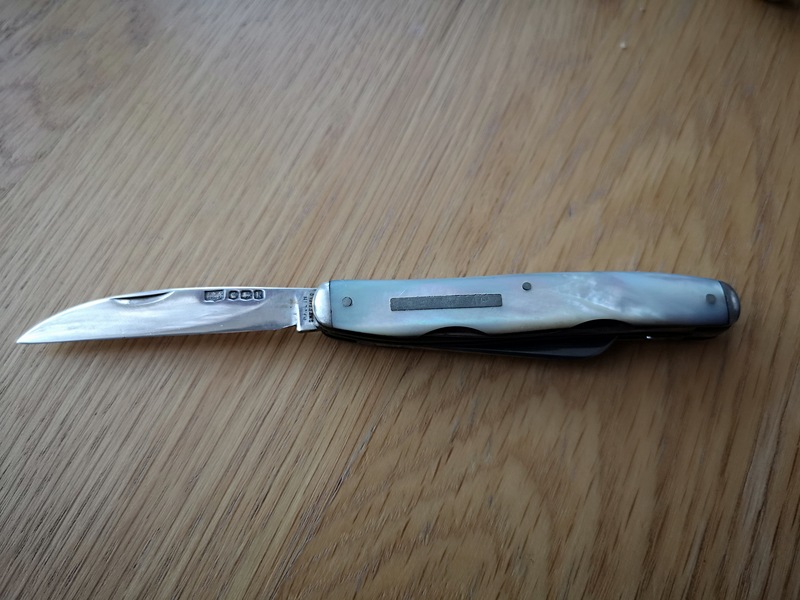 Hello, I have tried to sort a little “Blyde” company history around “Adrians” JNO knife, but to be truthful I wish I had let the confusion of “Blydes” bide. I have worked with a sketchy Blyde skeleton I formed out of the “Ancestry” cupboard. 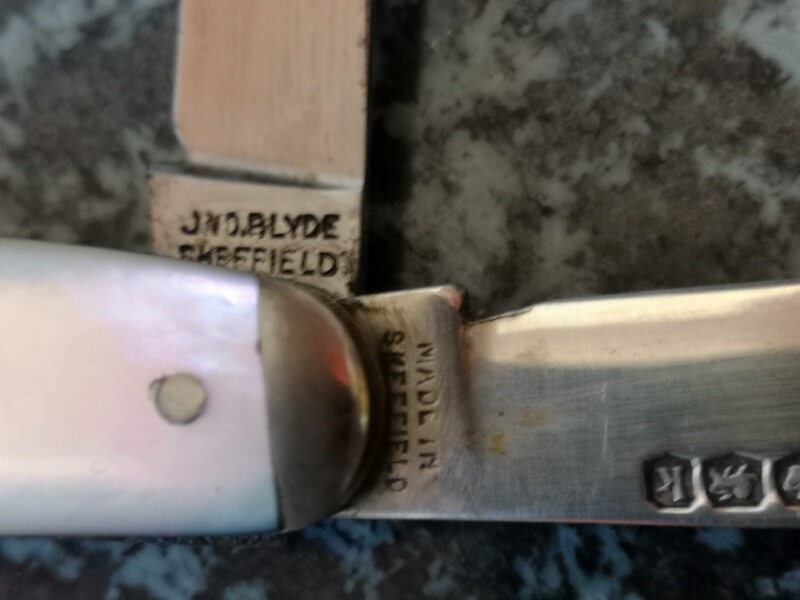 It seems from an 1876 advert that the progenitor company for the manufacture of “Adrians” knife was James Blyde and Son; the company had been established in 1841. Subsequently, the company became “John Blyde Ltd”. Well that’s clear isn’t it? Unfortunately, the first “James”, begat another “James” and subsequently a “John”. So who is the son then? The original “James Blyde” was possibly Sheffield born in 1803 and in 1841 he was described as a scissor smith. At that time he had a daughter “Sarah Ann”, 3 male children, the James aged 14, the John aged 8 and a William aged 2. In 1851 he had a daughter now “Sarah Edison”, with James, William Edwin, Edwin and an Eliza Ann. Confusingly, James is now said to be 17 and where has John gone? Something seems strange here and below is a mini grid concerning the old James Blydes first 2 sons. To me there is a mistake in the ages given in the 1841 census. The ages are transposed. John is the firstborn and James the second born. “James Blyde and Son” is father, James, and firstborn son John, and as you would expect John took over the concern. Apparently in the 1861 census John is married and a “hardware manufacturer” employing 8 men and 2 boys. He has a son “Arthur J.” aged 4. We see an “Arthur Jno” again in the 1881 census, when 24, and working, probably, as a “general clerk cutlery manufacturers”. The old “James” in 1861 was described as a scissor finisher and in 1871 and 1881 he is called retired”. 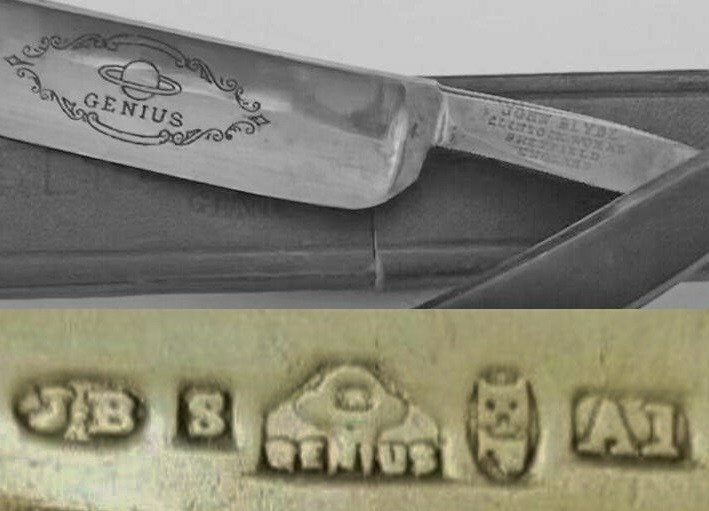 Taking information from the ad I first mentioned (and confirming Johnm’s imput), the corporate mark was then the word “GENIUS” under a pictorial planet “Saturn” and the products are described as high quality scissors and they are also producers of specialist equine scissors and grooming tools. The address given was “Clintock Works” at 72 and 74 Burgess St. Sheffield”. In subsequent history “Clintock Works” has another address. By 1883, the business is said to have moved to Clintock Works, Milton Street. 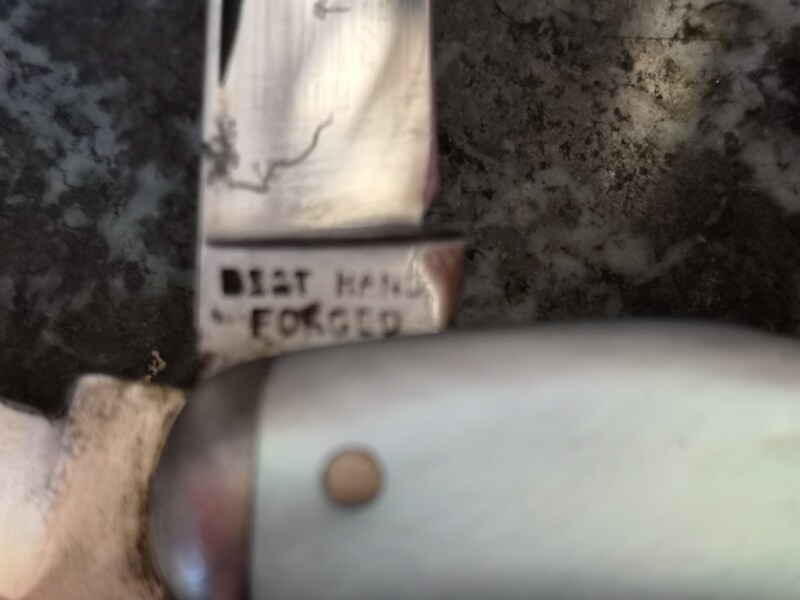 That Genius mark does not appear to be on Adrian’s penknife blades but it is regularly seen on Razor blades and it may be the matter of blade size? A couple of marks shown are below, including one on a spoon (the latter is just for me and the less cut throat readers). On a 2nd trade ad, this one from 1921 “John Blyde Ltd” describe themselves as cutlery specialists including offering pen and pocket knives (the ad is a bit like “Johnm’s” ad shown earlier in this post). This is more the age of Adrian’s knife and “Genius” was shown on the ad as a trademark (not corporate mark this time) and with the statement it was granted by the “Cutlery Company” in 1865. 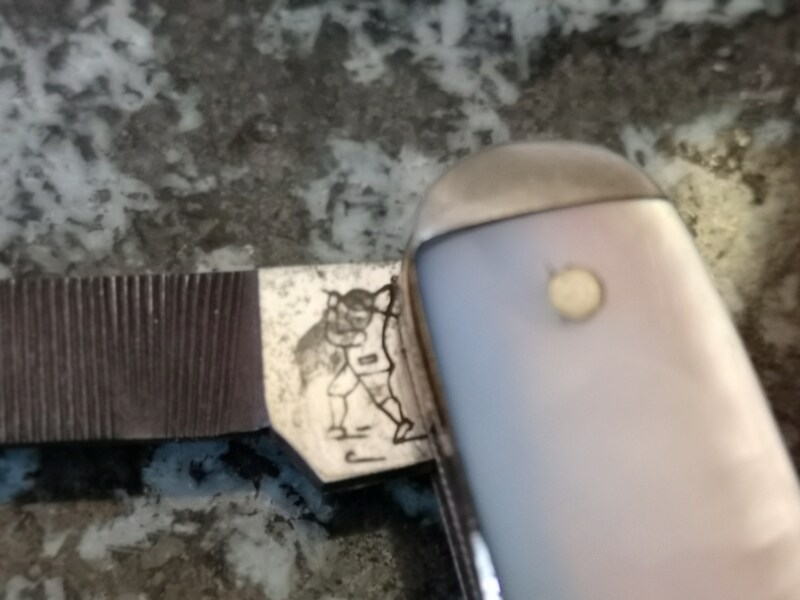 Adrian’s knife carries that other trademark, the “Golfer” that goes with the “Sure and Far” logo. 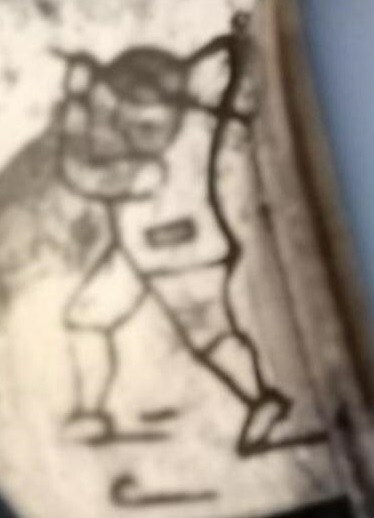 I found a creditable reference relating to the “Golfer” pictorial mark and it said that the mark belonged to “A.J.Blyde” of Clintock Works Sheffield. Now, there is a familiar name again, the 1881 referenced son of John Blyde. John Blyde died in December 1899 and a Sheffield newspaper report concerning his funeral is listed in another post on the Forum (I will reference it at the end). My quick synopsis is that John was taken ill on his way to work and later died. He leaves a Son, “Arthur Blyde” who will likely carry on the business. 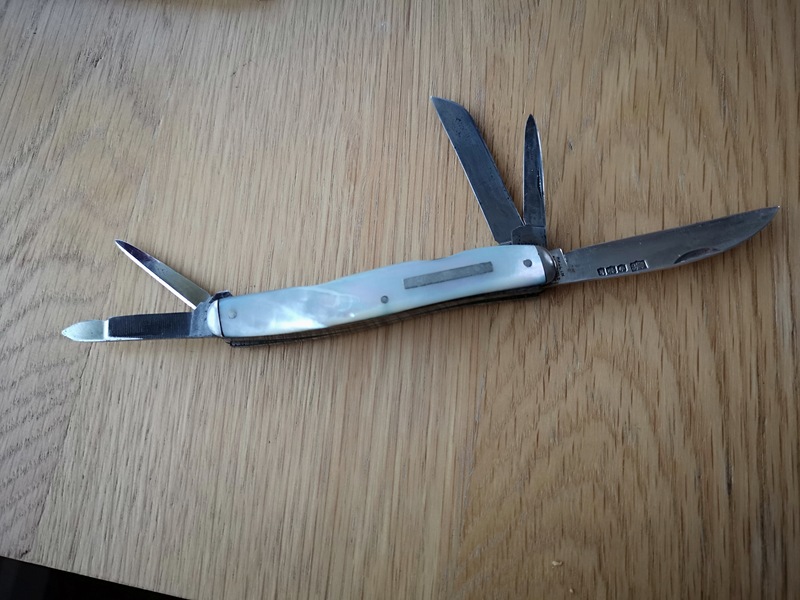 We are now coming to the period of that nice utility knife pictured at the start of Adrian’s post. “Strazors.com” gives a reference (probably the same as Johnm’s above) which says A.J. 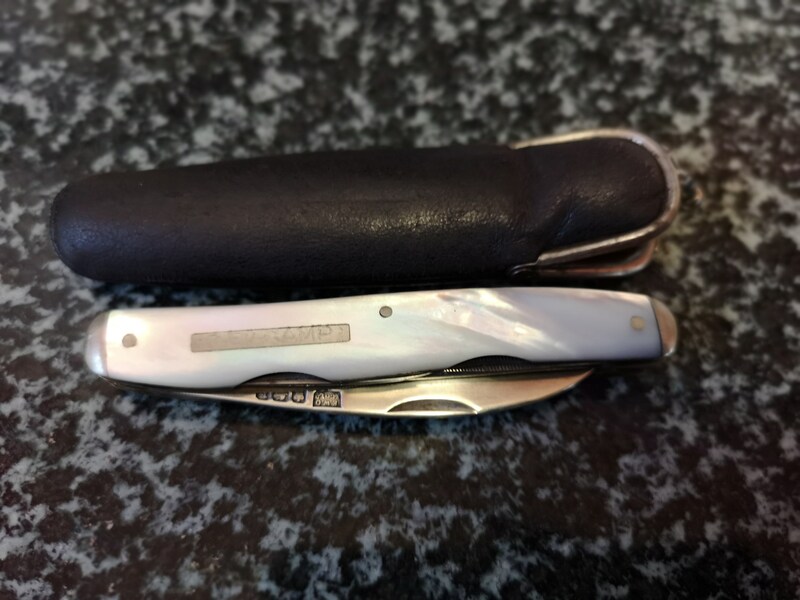 Blyde died in 1920 but the firm continued, including absorbing “Greenhoughs” and it famously made quality hand forged surgical scissors and pen and pocket knives. It would be good to know what if any “Blyde” name was used after 1920 but they closed in the 1970’s. Any corrections or additions welcomed. Both the ads I quote from can be found via Graces Guides. And that particular post has references to some of the other members of the original James Blydes family. There may be enough for another post!